After almost a year of my blog’s existence, it’s still sometimes hard to believe it’s real. I feel like I just write about what I love. And I’m elated when someone actually wants to listen! Every single follow on Twitter, every single retweet of my blog post, and every single view my blog receives makes me happy. So I was honored to have received my first invitation to a beer bloggers’ event recently! 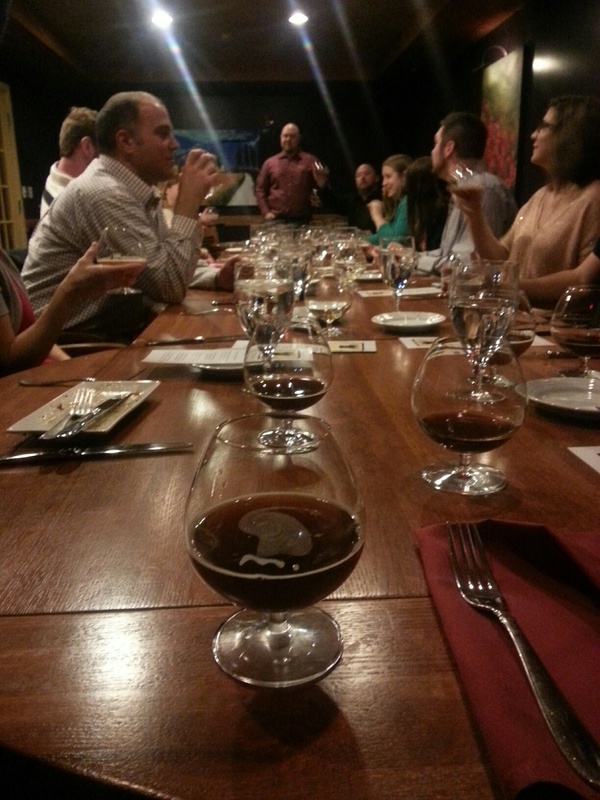 The PA Beer Alliance held a beer and food pairing dinner for some beer bloggers this past weekend. Luckily, the event coincided with my already planned work trip to PA! 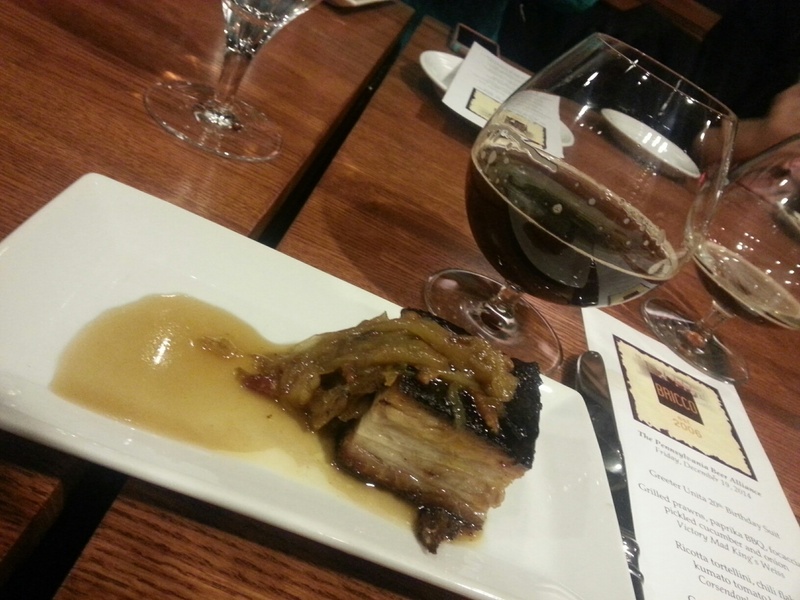 The beer and food pairing dinner was held at Bricco in Harrisburg. Honestly, the thing I was most looking forward to wasn’t actually tasting the beers and eating! (For like once in my life.) I was really looking most forward to meeting other blogging beer geeks! I arrived right on time for the event and was directed to the private room where it was being held. I asked if there was any particular place they wanted me to sit, and was directed to choose any seat. I sat near the small grouping of people who had already arrived. We waited for the others to arrive and started chatting. I asked where everyone was from, and those sitting around me all seemed to be pretty local. Everyone else had arrived at this point, and servers began to pour our “greeter” beer, Uinta Birthday Suit Sour Brown 20th Anniversary. Note the word “sour”. As I geekily (Yep. I just made a new word.) sniffed my beer in anticipation, others around me had started to taste and talk about the beer. Another person exclaimed, “I’ve never had a sour, but this is actually pretty good!” Then they turned and asked the person next to them if they had ever had a sour, to which the answer was a “no”. It was fun to chat with the Beer Alliance folks. We talked about my blog and why I started it. And somehow, we segued into my post about “why you shouldn’t drink beer from a frosted glass” that some of them had read. Prawns. Prawns are basically large crustaceans that resemble shrimp. I think people sometimes can imagine beer and food dinners as some pretentious, snobby events. No one was there who didn’t have an appreciation for craft beer or good food. Every foodie and every beer geek is a learner and has likes and dislikes. One of my few food dislikes is food that is still giving me the ol’ hairy eyeball on my plate. Clearly, I wasn’t the only one unfamiliar with how to eat this little guy! A few courses and a few beers down, I took the opportunity to move on down to the bloggers end of the table. Well-played! I chatted with Tierney, founder of stoutsandstilettos.com and loved her! I had checked out her blog before and somehow discovered I was Untappd friends with one of the bloggers from her site. I’ve always been intrigued to know what other beer bloggers are actually like. I truly expected and continue to expect that all beer bloggers are these fun, weird, quirky, super-awesome people who are often the life of the party. She was super down to earth and outgoing, and we might have become insta-best friends that night. (In fact, I’m pretty sure we proclaimed that!) I think it was my endearing potty mouth that did it. (Sorry, Mom.) There’s something about the proper use of swear words that just proves you can trust a person to be honest. Reading her blog, I know she’s my kind of person! It was great to talk to someone who has been blogging for that length of time who still has all this passion for beer. In telling him where in PA I was from, we began talking about my favorite hometown bar, The Knickerbocker. (Literally, every time I visit home, this is where I can be found. Usually for dinner with my family, then to be surrounded by my great group of friends afterward at a big table full of drinks. I miss it!) He had been there, and actually said it garners a mention in his book t this spring about the Mid-Atlantic beer scene. Very cool! That one will be added to our library of beer books. Almost a year ago, my blog really was born from a long chat at a bar and bottle shop with two other beer geeks who shared their beer and stories with us. Craft beer is really a part of who we, as beer geeks, are. It’s in our blood. (As I’ve mentioned before in other posts… literally.) Craft beer lovers are passionate people. They’re teachers. They’re learners. They’re beer geeks. Usually regular geeks, too. (Semicolon, parenthesis.) They’re exciting people who inspire. People who instill this passion in others. Thanks for the great opportunity to connect us all, PA Beer Alliance. And to all who read my blog: Thanks for an inspiring first year! I look forward to so many more to come! Blog Fuel: Three Floyds Pride & Joy. Thank you for coming! It was great meeting you and we are happy you had a good experience!